For our last week in Vietnam we spent time exploring the south. 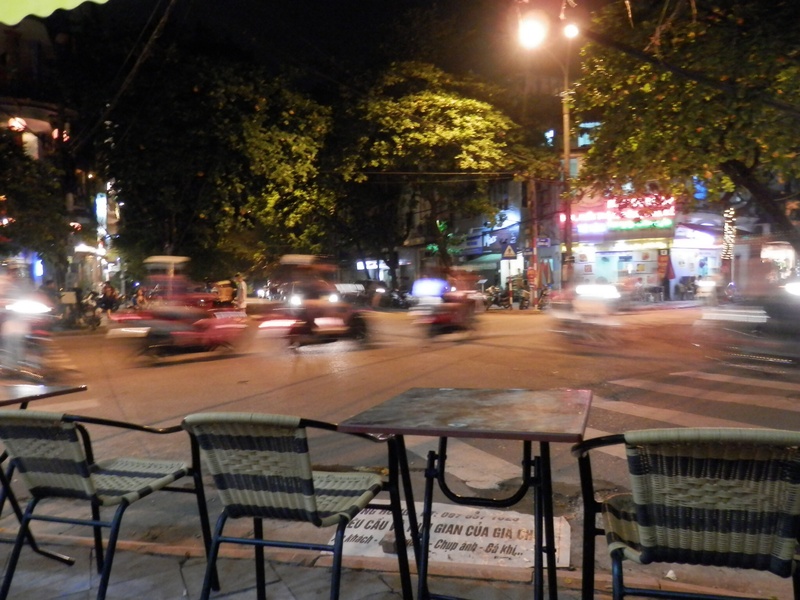 We started in Ho Chi Minh City, or Saigon as everyone still calls it which is unbelievably busy with motorbikes and people everywhere and some torrential rainstorms. We’ve visited a few of the Vietnam/American war museums including the War Remnants museum and the Cu Chi Tunnels which are a network of tiny tunnels where over a thousand people lived and fought underground during the war. They’ve made them wider to allow us chubby tourists down now, but it was still a pretty claustrophobic experience in there. 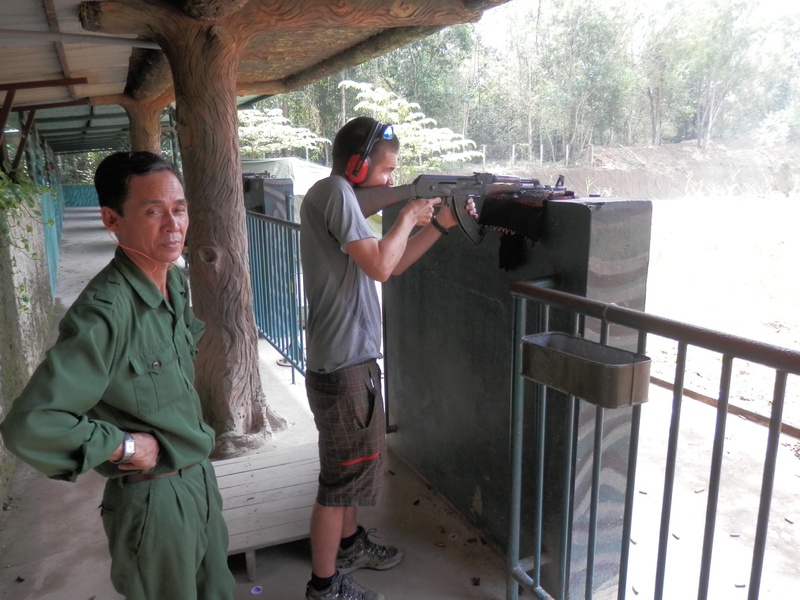 There are examples of the hideous traps that the Viet Cong used to capture American soldiers and Sam demonstrated his manly skills by firing an AK47. 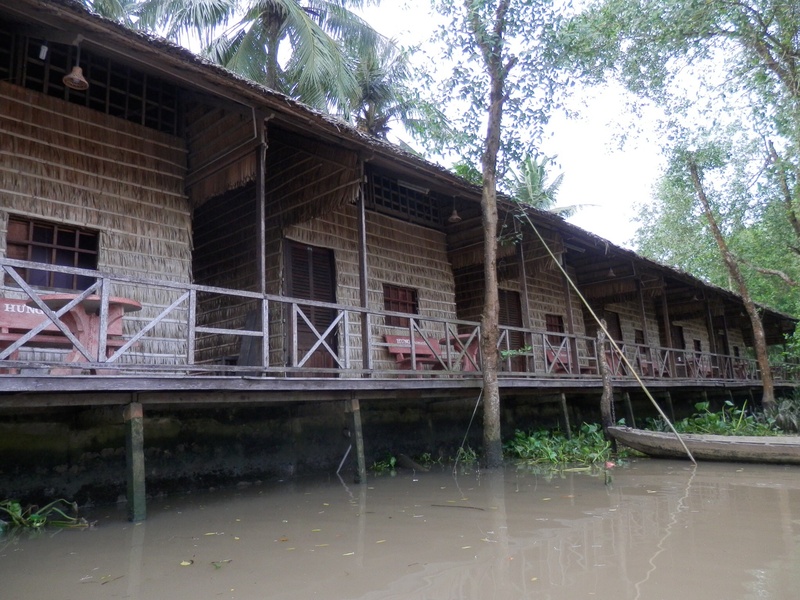 After Saigon we headed into the Mekong Delta and spent two nights in a homestay. 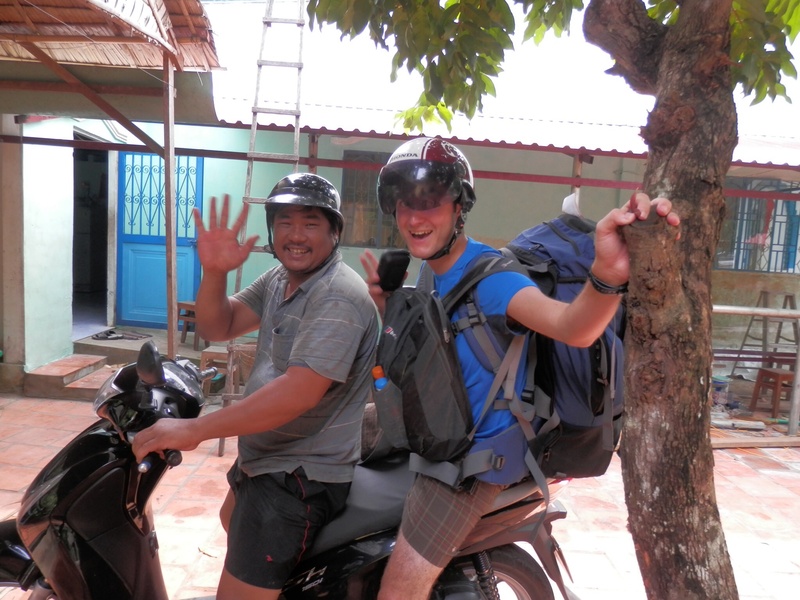 We had our first experience on the back of a Vietnamese scooter, which we had successfully avoided up until now. It was quite fun and Sam even managed a video. After the market and some free pineapple we went around some of the smaller canals, visiting a farm and a rice factory, and saw local people washing and swimming in the rivers. 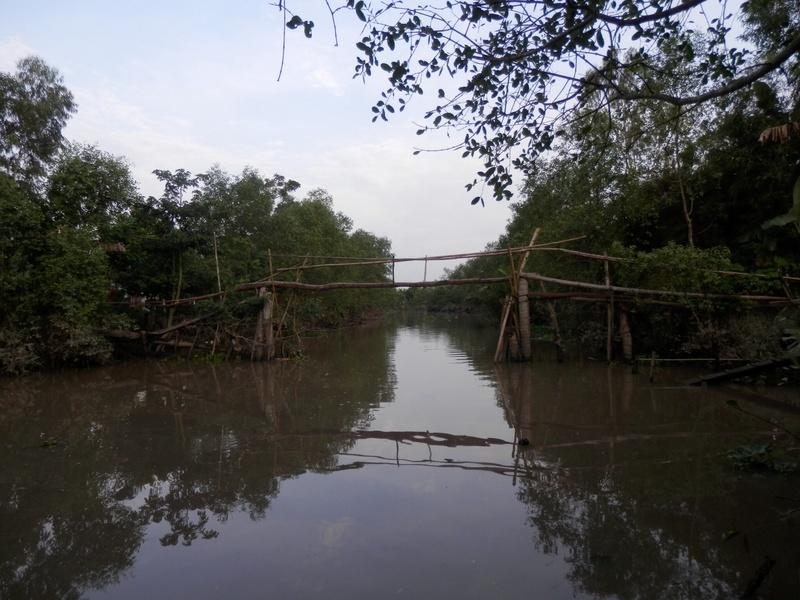 We took a bike ride around the villages where Mr Hung showed us some of the fruits that grow and took us over a bamboo bridge, where all the local kids gathered happily to see if the westerners would fall off. We spent a nice few evenings eating great homemade food, learning how to make spring rolls, drinking happy water and learning the Vietnamese for “Cheers” – Moch, Hai, Bah, Yo! After a couple of days in the very pleasant Hue, we moved on to Hoi An just a few hours down the coast. 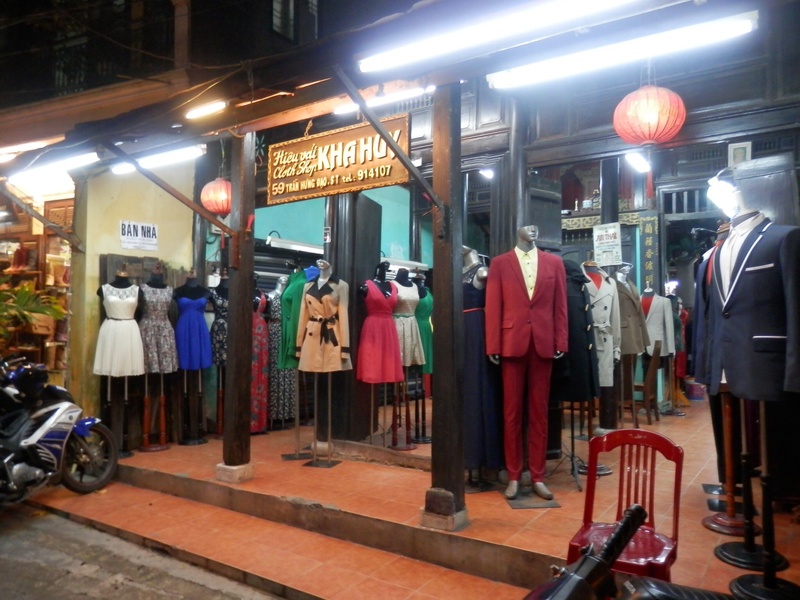 Aside from the bus stopping at a shopping centre full of pearl jewellery, which we stayed outside of in protest and fear, the journey was fine and we got to Hoi An at 11.30. 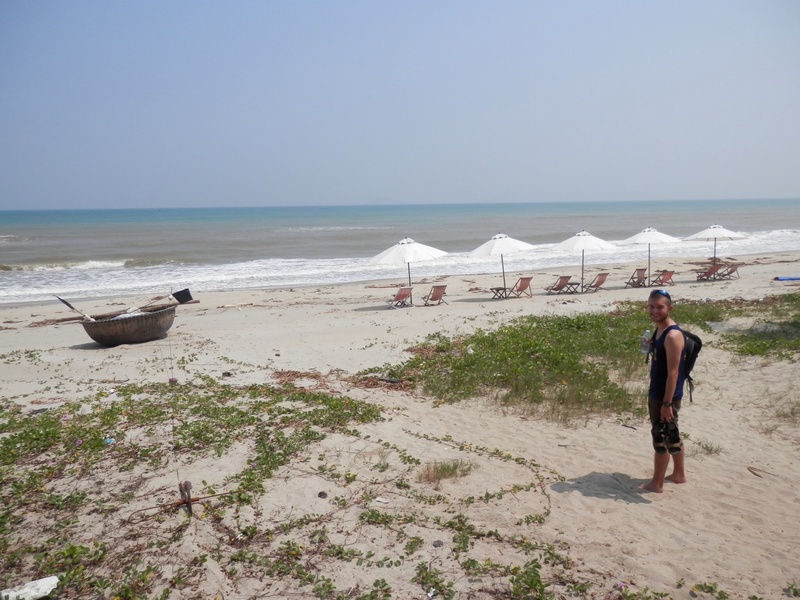 We hadn’t booked, but had an idea of where we wanted to stay – Law was convinced that we’d get a better deal by haggling! Fortunately the town is quite small and the weather wasn’t too hot, so we made it to the hotel and ended up with a room a couple of dollars cheaper than online. 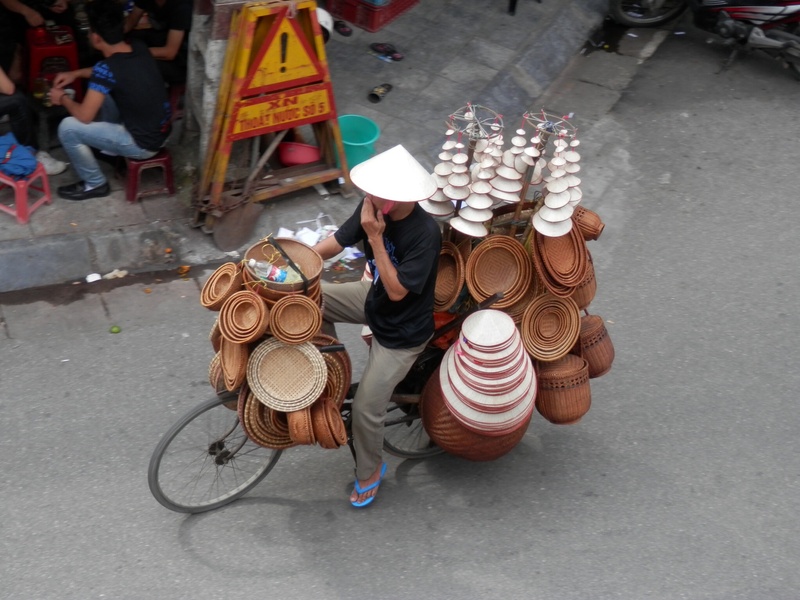 Hoi An is great – a tourist town for sure, but very different from the similarly sized Yangshuo in China. We haven’t been hassled or harassed by shops and restaurants, and it is so much quieter. The centre is called ’old town’, a collection of houses, shops and restaurants along the riverfront and in the narrow, winding alleys and roads off them. It feels like it could be very touristy, but the prices have been okay and the weather has been great. It is famous for its tailors, who will custom make anything for in a ridiculously quick timeframe, and which seem to be in every other building. However, we have avoided these – the bags are full enough as it is! There are a number of cultural sites and sights in and around the town, and we’ve been here for 4 days, so… we have seen very few of them! 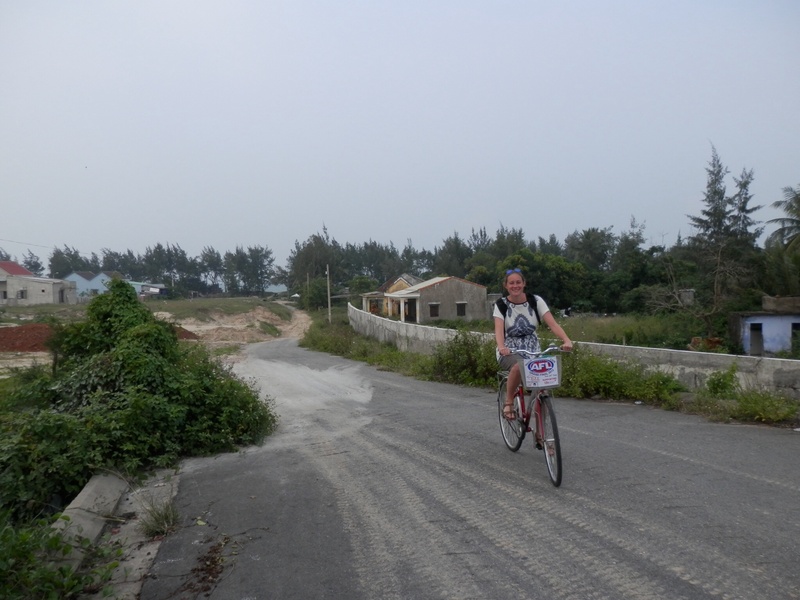 Instead, we’ve hired bikes for a dollar and cycled out 4 or 5 km to the coast each day and chilled on the beach. There are 2 main beaches, each a cycle ride away, with various restaurants and bars right on the sand. They aren’t too busy, but there are of course the loungers for hire and handful of locals trying to sell you everything from sunglasses to newspapers, nuts to ’jewellery’. Between the two beaches it’s all sandy coast, and on our first full day we found a great little spot to relax. Following a track off the main road, we cycled down towards the sand dunes. Law’s chain came off, and as we got covered in oil trying to fix it, and very friendly local lady came out and tried to help. She then let us wash our hands in her cafe / house, before we used her sun loungers to be the only people on that stretch of beach. We had a good cheap lunch here as well, Vietnamese baguettes with beef, salad and herbs – so naturally we came back here for the next couple of days. It has felt a bit like being on holiday from travelling (which must sound rich), beaching it by day and wandering around the old narrow streets for food and insanely cheap beer by night (a glass is around 9 pence). 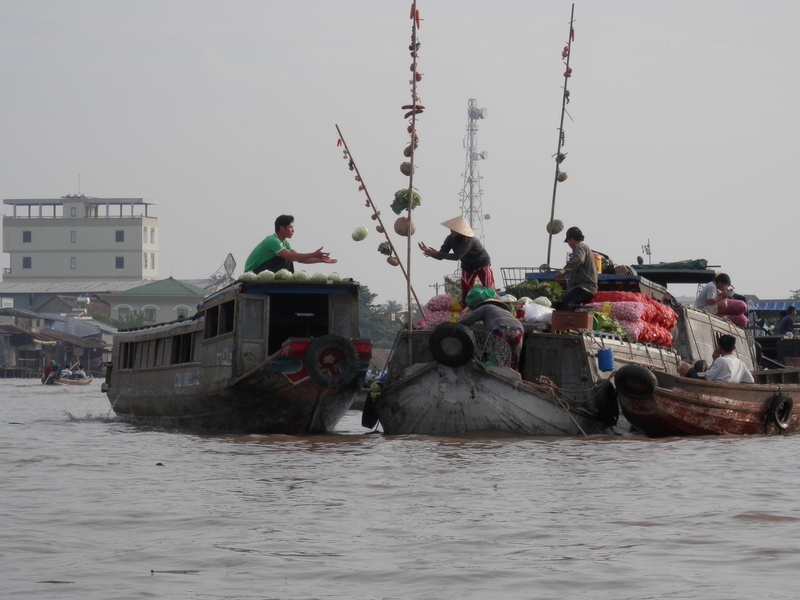 We’re moving on to Ho Chi Minh City today though, beginning our last week in Vietnam. We also had a Skype meeting with our volunteer organiser at UBELONG, who gave us a lot more information on our placements in Phnom Penh. We’re now looking forward even more to these, to contributing something other than tourism to a place. Also, the thought of not having to pack and unpack the bags for more than 3 days is very comforting! 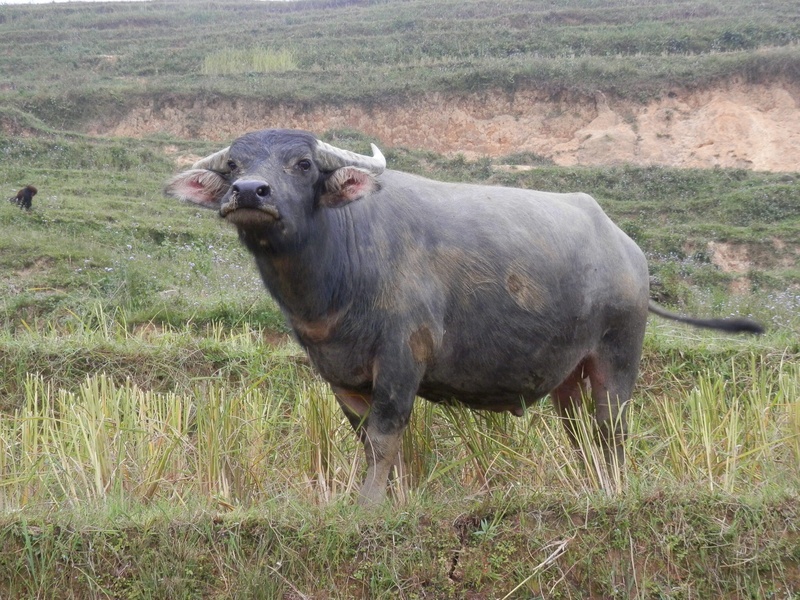 On the flight from Hong Kong to Hanoi, I realised I’d forgotten to include the funniest / weirdest thing about China in my last post; the fact that Chinese people loved nothing more than taking photos of us. Talking to other travellers, this seems pretty common – as well as sneakily snapping away and giggling, quite a few came up to us and asked to pose. 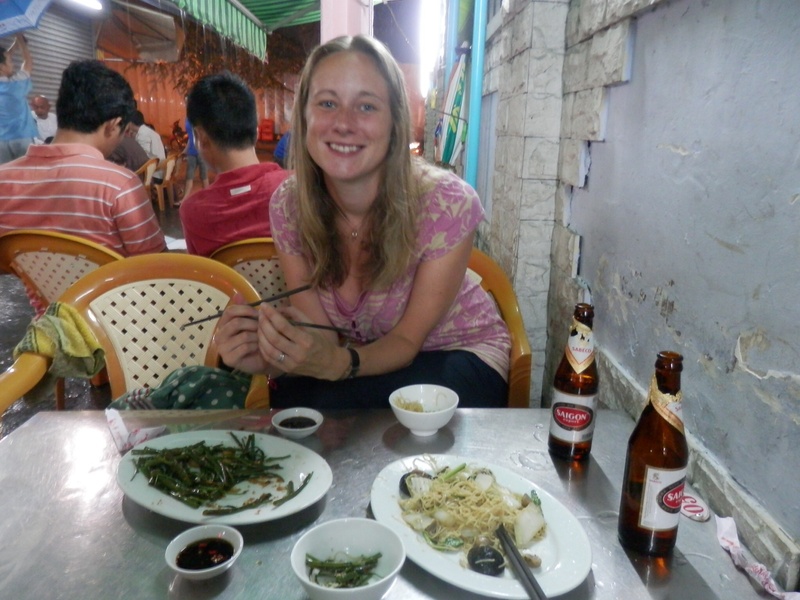 I thought I wouldn’t have an excuse to include this in a post, but within 24 hours in Hanoi it had happened again! 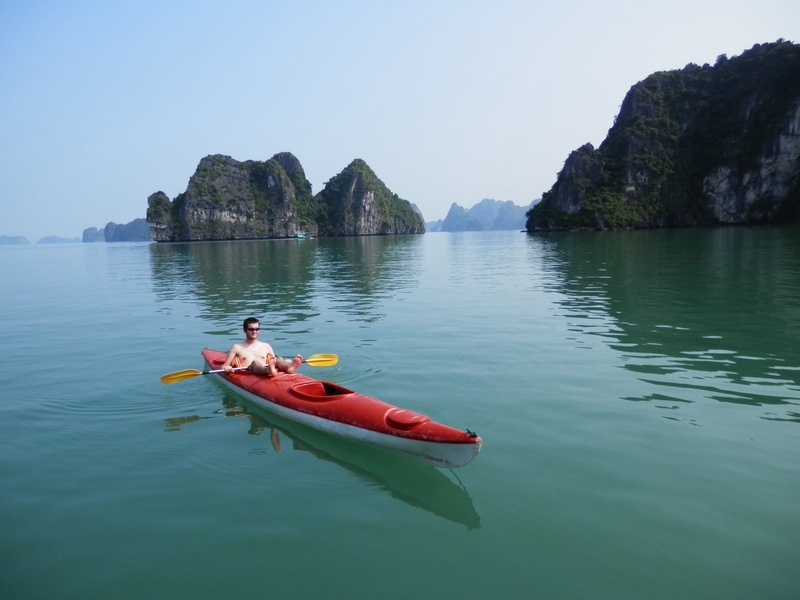 After a couple of days we arranged a tour out to Ha Long Bay, an incredible stretch of coast with almost 2000 limestone karst peaks and islands shooting up out of the water. The first day felt a bit like we were cattle being herded, following countless other boats to the same spots, cramming into the same famous cave and then hiking up the same peak. After braving the bugs in our cabin all night we were picked up early the next day by a smaller local boat, which was well worth the extra Dong. We spent the day practically on our own, with hardly any other boats around. The sun came out and the entire day consisted of sunbathing, jumping from the boat into the sea and kayaking into lagoons through tiny caves and tunnels. To top it off, we saw monkeys! We did have some mild drama when the tour company phoned to say that the boat we had been on had broken down, so we spent a couple of hours imagining our bags at the bottom of the ocean, but they were in the new (and nicer) cabin at the end of the day. The journey back to Hanoi took most of the following day, with the morning on the top deck and the afternoon in the minibus. That night, after spring rolls and beer, the only English language channels we could find were showing football or Titanic – Law won. 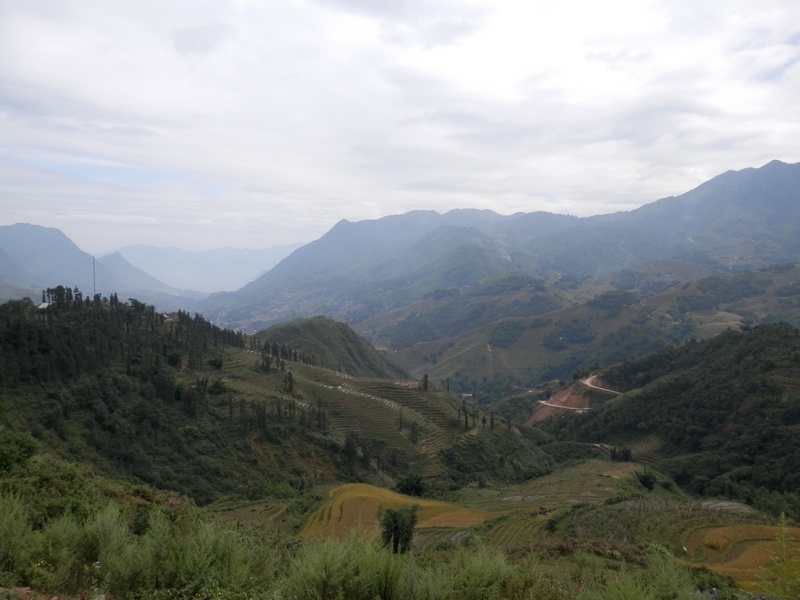 After Ha Long we had lined up another tour, this time to do some trekking in Sapa in the far north of Vietnam. Our night train was fine, with nicer cabins than China, but we did arrive a couple of hours late. 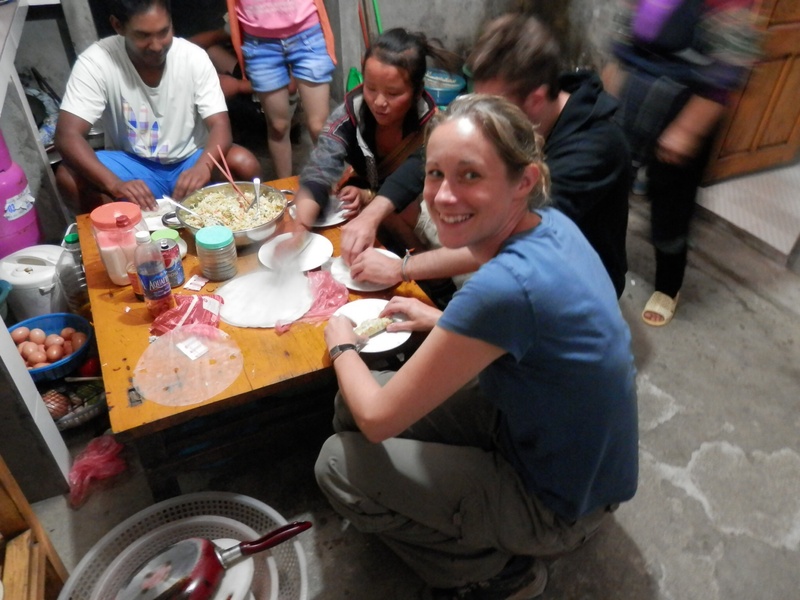 We had booked a home stay in a small minority Hmong village with a local guide, around 12km away from the town. The first 500m were fine, until our group was stopped by ’government’ officials. Apparently, our guide hadn’t filled out the correct paperwork and so they wanted to take us to their offices in town. This is a standard scam in Southeast Asia, and not knowing what to think we took it easy and sat in the road. The guys, and by this point it seemed half the village men had come out, finally let us pass, after taking the the guides licence away and hooking us up with a new one. We were all thinking that the poor local guide woman had been screwed over, though we did later find out that she had been in the wrong – apparently she was taking the dollars for the entry fee and trying to sneak everyone into the valley without buying tickets! It wasn’t a particularly taxing hike, but the views are breathtaking of the rice paddies, villages and mist topped mountains. 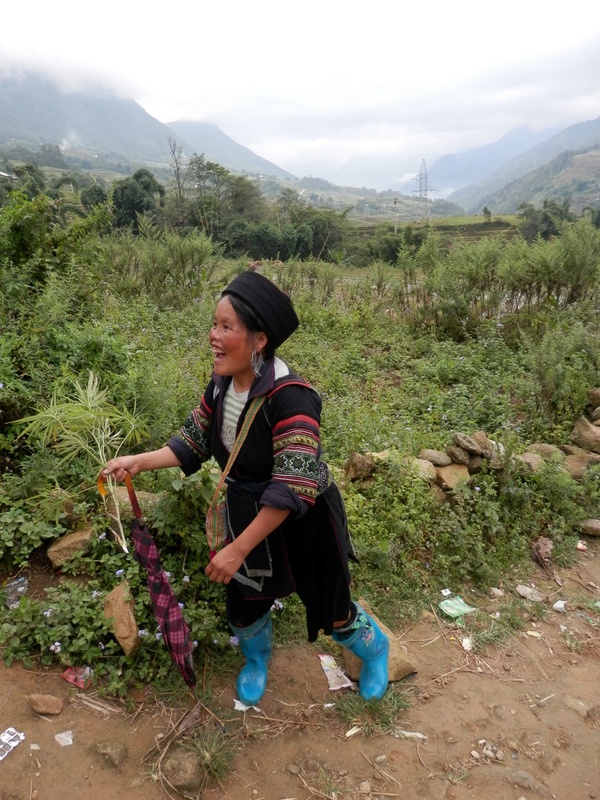 We were followed down the mountain by several local women in traditional dress, who were friendly and helpful all the way – until we reached the bottom when they surrounded us and tried to make us buy crap! It was quite intense, so we did end buying a pretty pointless bag for a couple of bucks. They were good at guilt tripping. We spent the night in a home stay, which is basically the loft of a building with a load of mattresses on the floor, but we were with a good group and the food was nice. 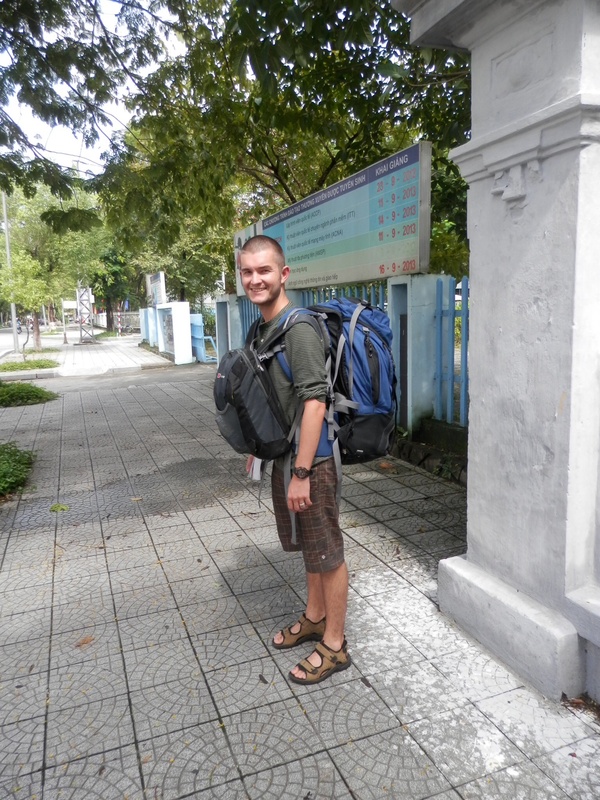 We then spent two nights on trains, one into Hanoi and then again the following night onto Hue. The latter journey was less pleasant, in the hard sleeper class and over 2 and a half hours late, but we made it. 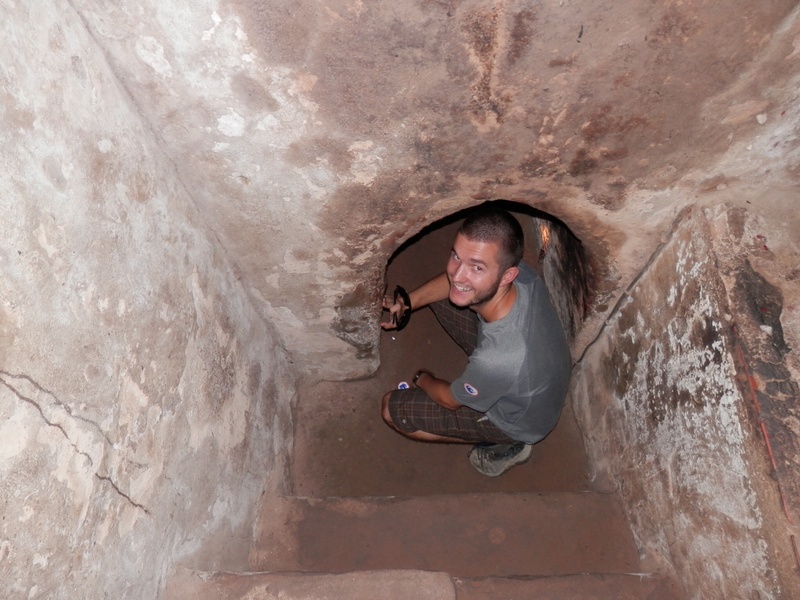 So, we’ve had intense monsoon rain, seen the ’Hanoi Hilton’ prison (full of propaganda about the American War and POWs), dived off a boat and kayaked through caves, seen low-level corruption, hiked through muddy tracks, haggled for a haircut and gotten millions of Dong out of the bank. Not bad for 10 days in ’Nam.